When it comes to easy dinners, these teriyaki chicken and rice bowls are our latest love. Seriously, the kids like this dish so much that I've made it once a week for the last month! This recipe has definitely become a tried and true family favorite by my picky little taste testers. The first time I ever made teriyaki chicken, I used chicken drumsticks. That was my trial run with this recipe and I can say that the flavors in the dish turned out great, but that cut of meat just didn't feel right for the meal. What we really wanted was that rich, teriyaki flavor in a more familiar, restaurant-style form. 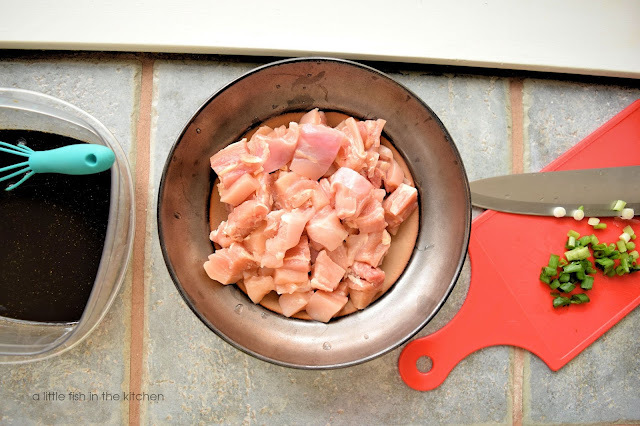 So, the next time we wanted teriyaki chicken for supper, I sliced up some boneless, skinless chicken thighs into bite-size pieces and used them in the dish instead. This second version with the smaller bits of chicken was a much bigger hit with the family, so that is that's what we're sticking with! Baking the meat worked out perfectly and I was pleasantly surprised at how much the end product really added a restaurant-style feel to this simple meal. What came out of the oven were some extremely tender, flavorful pieces of chicken with a super rich, golden color. 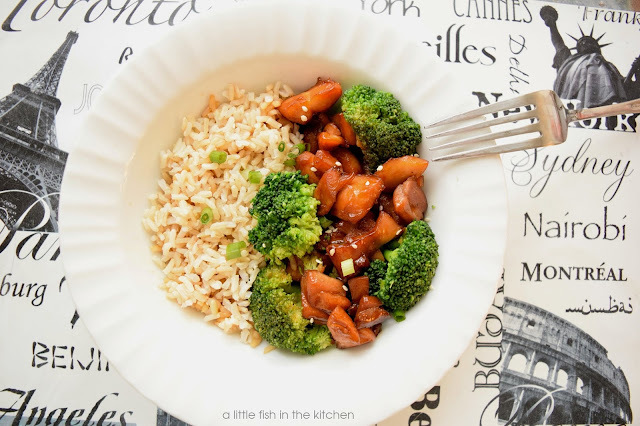 I just added some steamed brown rice and broccoli and we had a delicious and pretty meal in a bowl! I sincerely hope your family enjoys these easy teriyaki chicken and rice bowls too! 1. 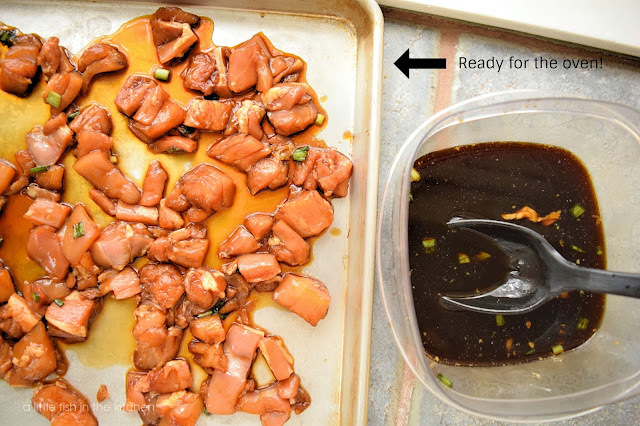 Combine soy sauce, water, garlic, ginger, brown sugar, honey and lime juice in a medium-size plastic bowl and stir. Add green onions and chicken pieces. Toss chicken with marinade, coating well. Cover the bowl and chill for at least 30 minutes. Chicken can marinate for up to 2 hours if needed, but remember to stir at least one time. 2. Pre-heat oven to 375°. Prepare a rimmed baking sheet with a light coat of non-stick cooking spray. Use a slotted spoon and remove chicken from the marinade. Spread it out evenly on the prepared baking sheet. 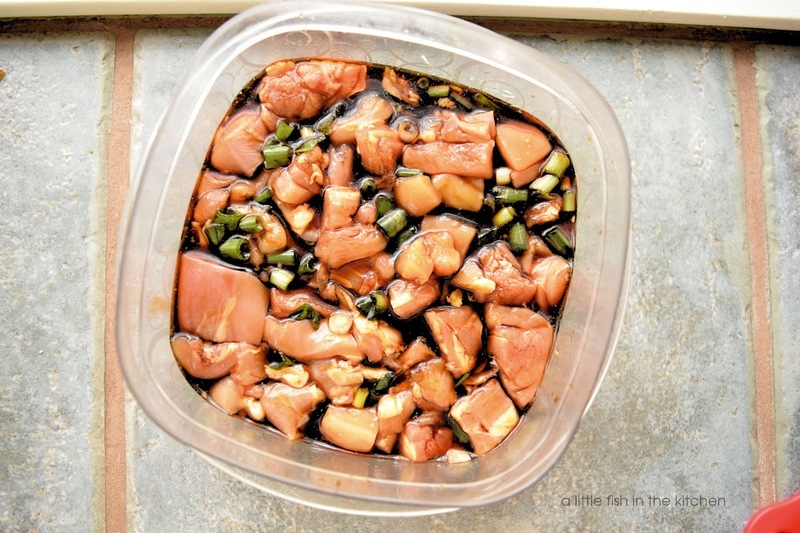 Reserve marinade to make teriyaki sauce (recipe follows). 3. Place the sheet pan into the oven and bake for 20-25 minutes, stirring at least once. Remove the baking sheet from the oven, place it on a cooling rack. 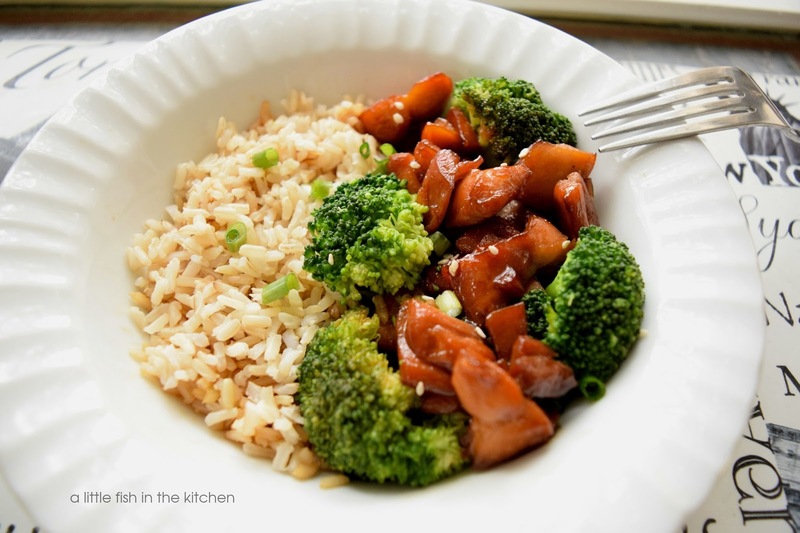 Place 1/2 cup - 3/4 cup of rice into a bowl and top with vegetables, chicken, and teriyaki sauce. Garnish with sesame seeds and fresh, sliced green onions. Enjoy! 1. Pour the reserved marinade through a fine strainer and into a small sauce pan (this will remove any extra bits of garlic, chicken and green onion). Heat the pan and bring the marinade/sauce to a low simmer. 2. Once the sauce is simmering, combine the cornstarch with 1.5 tablespoons of water in a small bowl or ramekin. Pour cornstarch mixture into the simmering teriyaki sauce and using a small whisk, stir briskly to make sure no lumps are formed. Bring the sauce just back to a boil, turn off the burner and remove the pan from heat. Serve a few drizzles of teriyaki sauce with the prepared chicken and rice bowls! 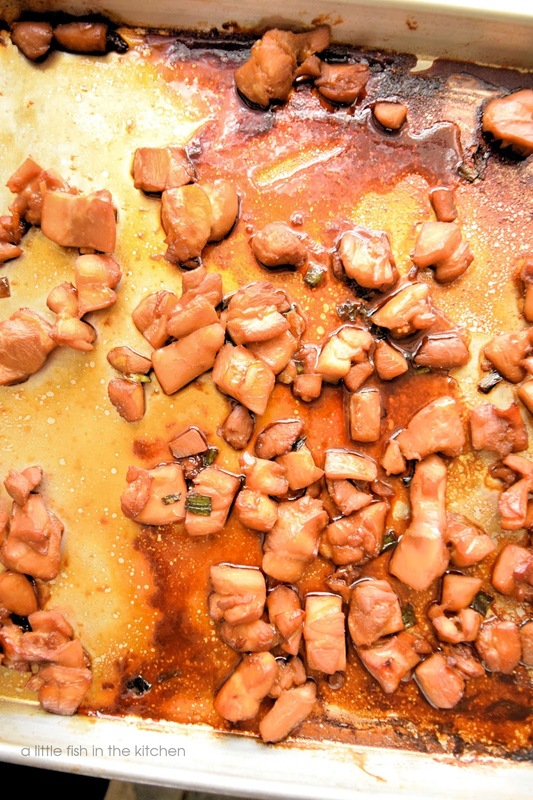 Teriyaki sauce works like magic, doesn't it? The rice bowl looks healthy and delicious. Sounds like a terrific meal! I need to pick up some broccoli and it will be on our menu soon!!! Perfect for a weeknight meal! We can get a nice walk in the neighborhood while the chicken is marinating! Love this, Marcelle! what a marvelous meal, marcelle--i can see completely understand why your kids love it! your sheet pan technique is awesome. Dear Marcelle, Teriyaki CHicken with rice and veg is simply the best! Really enjoy this recipe of yours! Hope you and the kids are doing well!